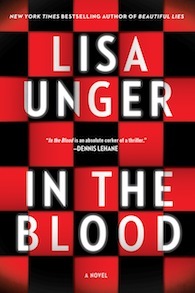 Write On, Wednesday: Bestselling Author LISA UNGER talks about books, writing, IN THE BLOOD & so much more! I am so very honored to have the amazing Lisa Unger with us today. 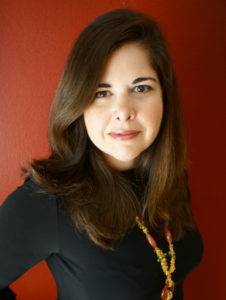 Lisa is the NYT bestselling author of 12 suspenseful tales that range from crime, mystery, family saga, to the familiar psychological thriller; she’s a reader, wife, and mother (on a fun note, watch this interview with Lisa and her daughter, Ocean Rae discussing children’s books http://www.youtube.com/watch?v=veY8wYhHweQ). Leslie Lindsay: Lisa, thank you for being with us today. Your books are crazy-good in a twisted, dark manner that keeps us turning the pages, yet they seem to straddle several genres. According to your website bio, “My novels center around strong women who find themselves in extraordinary circumstances, and explore themes such as the power of a single choice, the corrosive nature of secrets and lies, dark family legacies, and the secrets we keep from each other and from ourselves.” That said, how can writers authentically combine these varied genre aspects into a complete whole? Is it “just” writer-ly magic? LISA UNGER: Thank you for having me, Leslie. And thank you for the very kind words. I suppose you’re right in that the novels do straddle different genres. But I think it’s important for writers to remember that “genres” are classifications designed by book publishers and booksellers to market novels more efficiently. Writers should not be thinking about genre when they write. We should be thinking about character, setting, plot, prose and all the elements that unify to make a great book. We should be honoring our inspiration, putting in the time, and working hard every day to dig deeper and get better at what we’re doing. Which is not to say that genre is not important. But it’s important later, after the book is written. In the process of writing, it is far more critical to write authentically from an organic place. Every one of my novels begins and ends with character voice. I follow that voice and listen to that story. Most of my novels are dark, and all of them might be classified as mystery, or thriller, or crime fiction. But I don’t sit down to write my next “thriller.” I sit down to write my next novel, and I honor the character voices in my head. It’s not intent, and it’s not magic. It’s just being true to who I am as a writer. LISA UNGER: My years in publishing taught me some important things. I had always been a writer, but I lacked the confidence to pursue that dream. Working in publishing showed me that it was, in fact, possible to do what I wanted to do. My years in publishing also taught me that it wouldn’t be easy. Getting published is not an end to the journey; it’s the beginning. It’s a foot in the door, an invitation to roll up your sleeves and get to work. It’s harder to succeed as a published writer than it is to get published in the first place. Knowing that prepared me for the dizzying highs and crushing lows of life as a career writer. I am grateful to have that background, that I knew the realities of the business before I finally went for it. Leslie Lindsay: In those early days of writing, what do you think you did “right?”What could you have done better? LISA UNGER: Hmm … that’s an interesting question. I am not certain what I did right, or what I could have done better. In fact, I’m not sure that we can look back at any part of our lives in regret or in self-congratulation, since we never know what the consequences of other choices might have been. But I do know that I have always done my best. I am certain that each of my novels represents the pinnacle of my abilities at the time of its writing. And the only thing that has ever motivated me is the belief that every day I can be better at what I do than I was yesterday. I believe that each book I have written is better than the one that came before it. So, to be honest, I guess I wouldn’t change a thing. Leslie Lindsay: IN THE BLOOD—wow! It’s so well done. I knew you had me when we first meet a psychology student with a trust fund, a mess of lies, and a web of secrets. Each and every sentence is so carefully crafted with unique turns of phrase and dashing imagery. Can you give us a little kernel of how IN THE BLOOD came to be? LISA UNGER: The germ for a novel can come from almost anything – a news story, a line of poetry, even a photograph. In the Blood was inspired by an article I read in The New York Times Magazine about how certain doctors think they can see early signs of psychopathic behavior in children as young as five. This idea ignited my imagination and led me to do a great deal of research on the topic. And while I was reading, I started to hear the voice of Lana Granger. The only thing I knew about her was that she was hiding something big. But I didn’t know what. I also knew I had to tell her story. Like most of my novels, In the Blood is my delving into the question of what makes us who we are, and what power do we have to change ourselves. My father used to recite this poem for me when I was a kid. You cannot hide in snow/ no matter where you go/ you leave a trail behind/ that anyone can find. It sounds a little creepy, doesn’t it? He didn’t mean it to be; he’s just into the sound of words. It stayed with me and comes back at weird moments. And over the course of my life, its meaning has evolved as an allegory for the self. You cannot hide from yourself. The psyche won’t allow it. You must embrace everything, even the darkest and most unpleasant things within you. That’s the major theme of In the Blood. Leslie Lindsay: What advice would you give writers who are at that submission stage, who have a completed manuscript, and really want to get published traditionally? How do you see the publishing world changing? 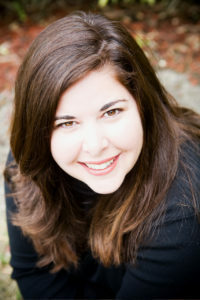 LISA UNGER: Just keep writing. Don’t wait to see if that book publishes, even if you are at the submission stage. Just keep writing. Dig deeper. Try to get better. Because that’s what will get you published in the end, being great at what you do. The publishing world is changing all the time; it’s true. And it’s changing so fast and unpredictably that you shouldn’t worry about it until you are actually published. And not even then! Just write the best book you can write. Write organically, exactly the book that your heart wants to write. You can’t hope to follow trends or write to sell, because those trends, too, change all the time. What doesn’t change is that everyone is still looking for a great story – agents, editor, and readers. We will always look to story to escape from or understand life a little better. We will always want a great story to lift us up, thrill us, excite us, and make us feel something. Publishing may change. But love of story is forever. There will always be a place for a great book. Leslie Lindsay: Is there anything obsessing you right now? LISA UNGER: I am always obsessed with questions of identity, nature vs. nuture, family legacies, abnormal psychology, relationships, religion, the many facets of love, and the things that connect us and tear us apart. I am most recently obsessed with psychic phenomenon, haunting, and addiction. I have a kaleidoscope of obsessions, always shifting, changing and building on each other. Thank goodness! Leslie Lindsay: What’s next for you? Working on another book—I hope! LISA UNGER: My next novel, entitled CRAZY LOVE YOU will publish in April 2015. I am currently at work on my first young adult book, and the 2016 adult title. Stay turned for more on all of that! Leslie Lindsay: Thank you for being with us today, Lisa Such a thrill! Can you kindly direct readers to your website, social media? Also, an author photo and book cover image would be much appreciated. LISA UNGER: Thank YOU, Leslie, for having me! And of course readers can find out lots more about me on the web! I am currently re-energizing the newsletter to include exclusive excerpts, giveaways, advice for writers and notes about what I’m reading, working on, obsessing about, listening to and watching. So do sign up! It’s going to be fun. And now for the GIVE-A-WAY!! Lisa has generously offered a complimentary copy of her new release, IN THE BLOOD to one lucky reader. All you have to do it SHARE* this interview via email, Facebook, Twitter, Pinterest, GoodReads, etc. and LET ME KNOW you shared by dropping me a line at leslie_lindsay@hotmail.com or leaving a comment in the comments section of this blog. If you don’t tell me you’ve shared, your name can’t be entered. GOOD LUCK!! *The Fine Print: Give-a-way open to US residents only. Contest runs Wednesday, 2/19/14 thru Saturday 2/22/14 at 5pm. You will be contacted via email if you are the winner. Please check “junk” and “spam” folders for an email from me. If you are not the winner, you will not be notified. Respond promptly with your mailing address. Ms. Unger, or her representative, will send you the book. Your email will not be used for any other reasons.